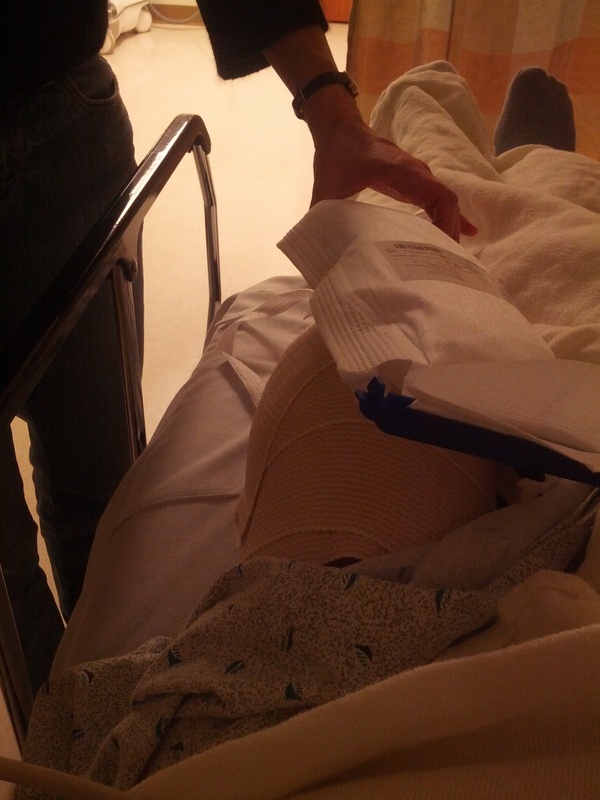 My arthroscopic knee surgery on my meniscus tear! 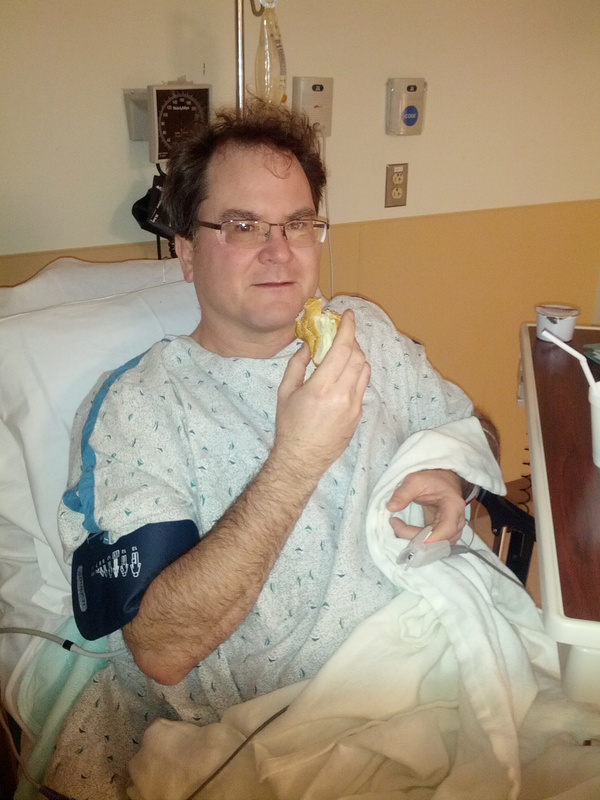 In October I scheduled an appointment with Dr. Juliano again (I brought him two red onions) and he ordered another MRI. 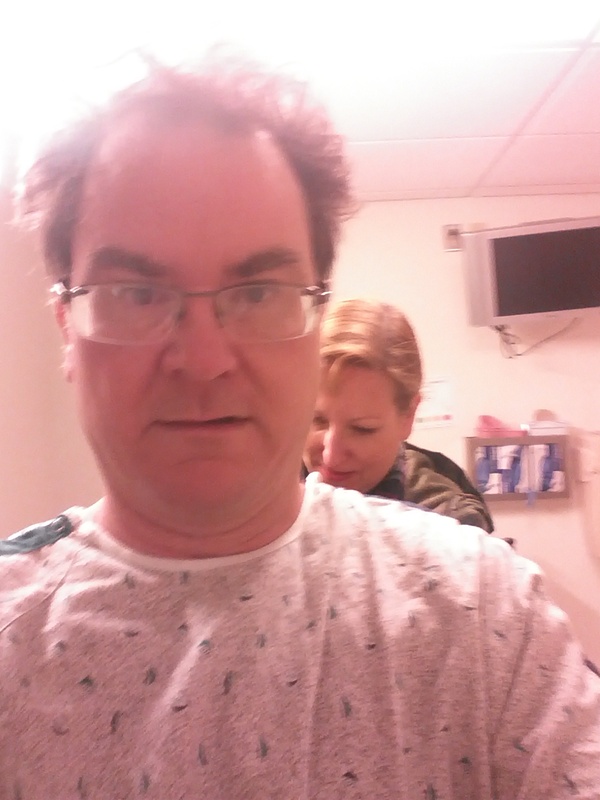 In my follow-up visit (which this Thursday will be 2 weeks ago) he said that the MRI was not 100% definitive but it appears I have another tear. He suggested I try a steroid shot in my knee and see how that worked. If after the shot the pain is reduced I could skip the surgery but if not I could get the surgery. Not only did the cortisone shot not work, it actually hurt. And since it hurt and I had prolonged knee pain post shot I ended up over compensating while bundling boxes, causing me to mess up my back and requiring me to see a massage therapist. 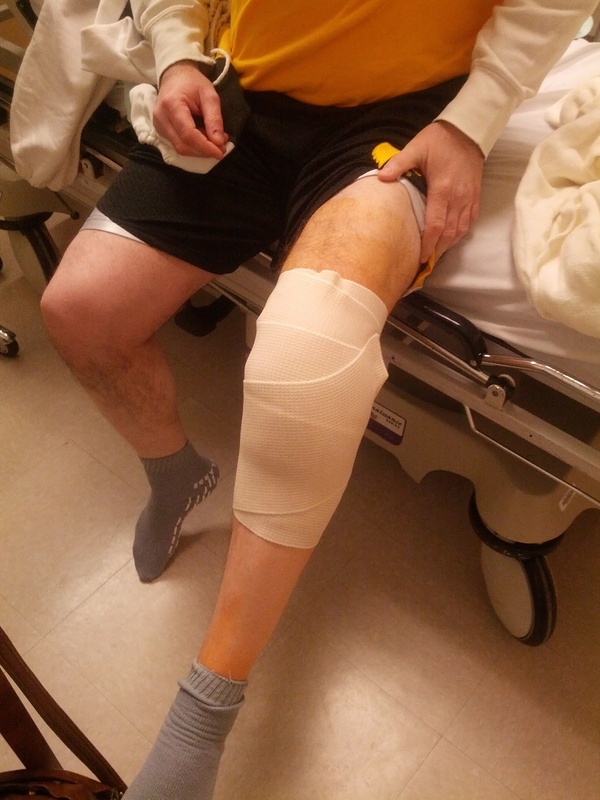 So, based on what happened post cortisone shot Dr. Juliano felt I should get the knee surgery. And I agreed. 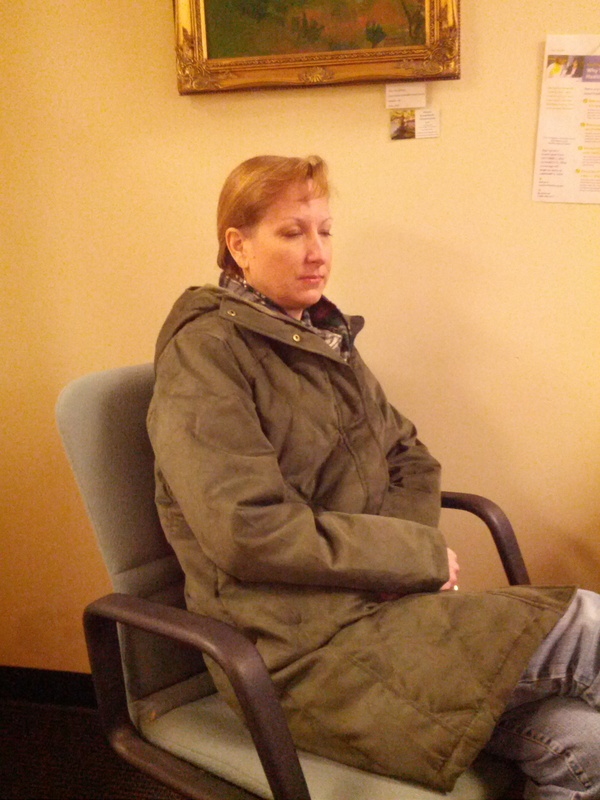 Now Eve was afraid that the pain and discomfort I felt was not so much due to a tear but was caused by instead arthritis in the knee. That, obviously would be very bad. I in fact saw Dr. Juliano back in 2010 about the discomfort I was feeling then and he felt it was probably arthritis as well. Obviously all questions would be answered as to what was causing my pain via the surgery. The following are a series of photos that chronicle this event. The only thing missing are pictures of the actual surgery. 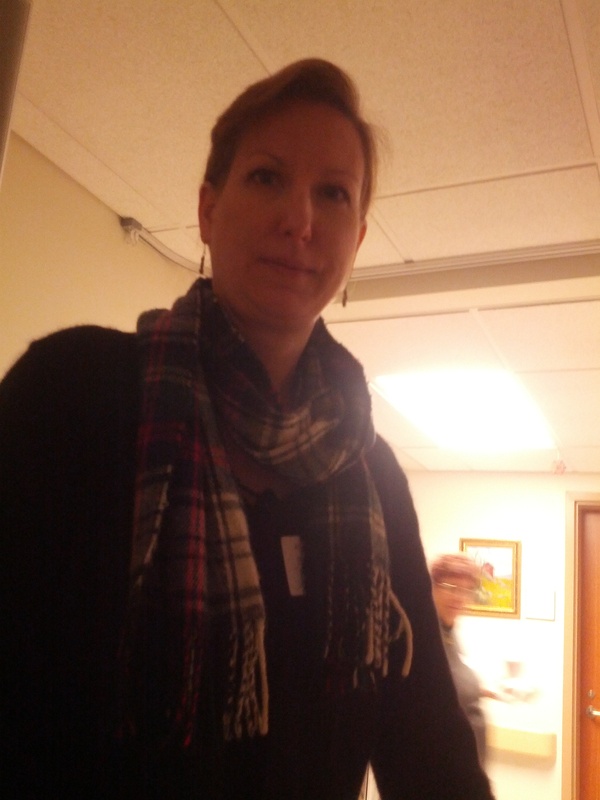 I know pictures are taken so I asked Dr. Juliano if I could have them for my blog. He laughed and said no problem. I hope to get them when I have my post-op appointment where he removes the stitches. 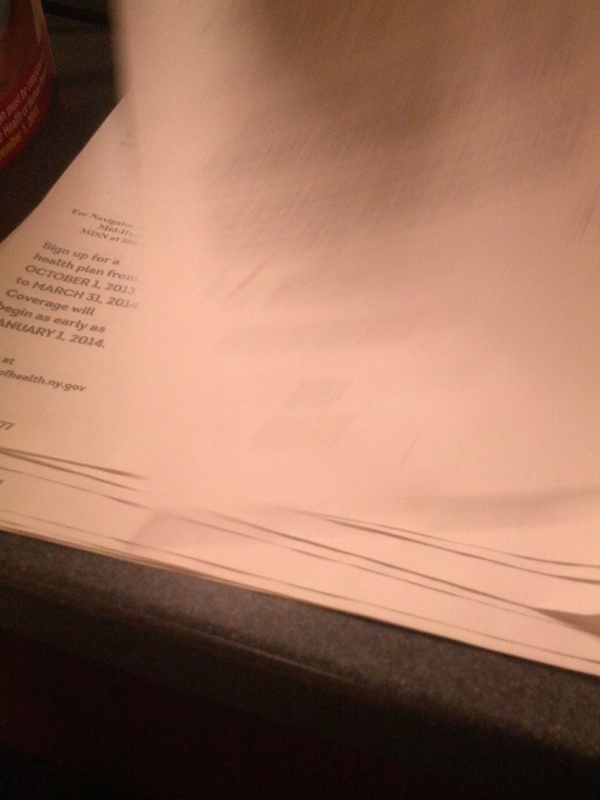 Papers to sign … lots of papers to sign …. 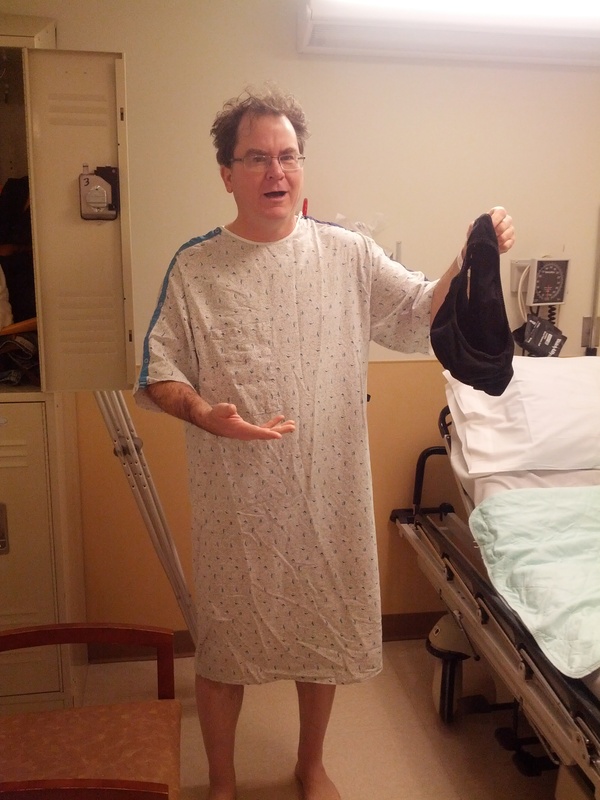 Eve tying up my gown … then the bad news … the nurse said I have to get entirely naked. 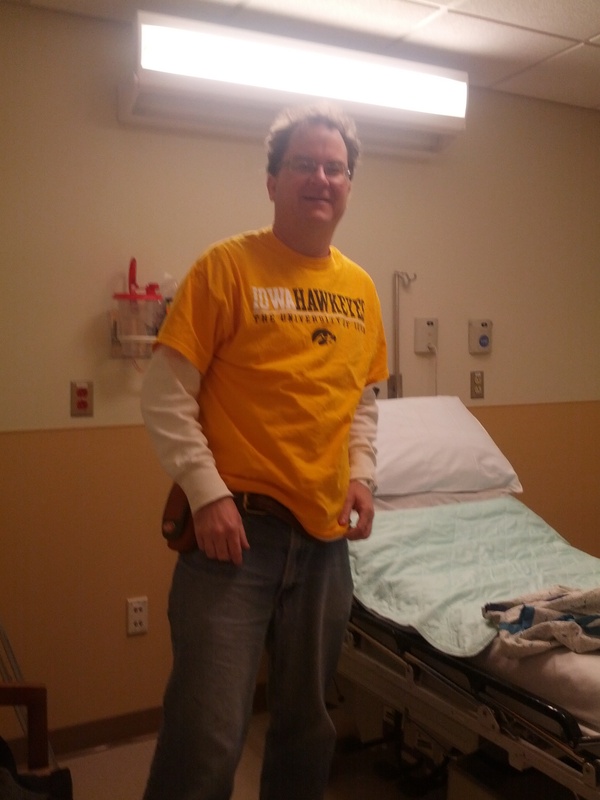 I anxiously explained to the nurse that tonight Iowa was playing Iowa State in men’s college basketball and for only the second time in the over 100 year history of these interstate rivals playing each other they are both in the top 25 rankings. 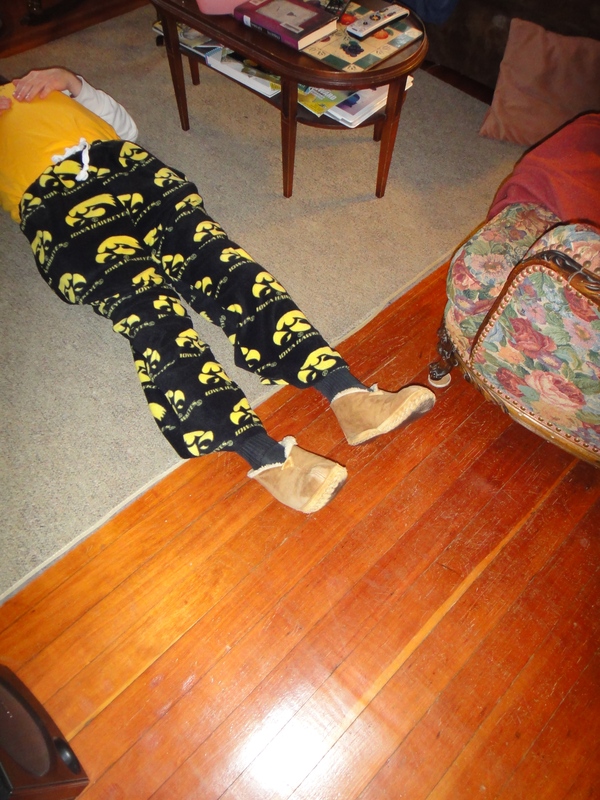 One note: Iowa lost to Iowa State that night by 3 points. 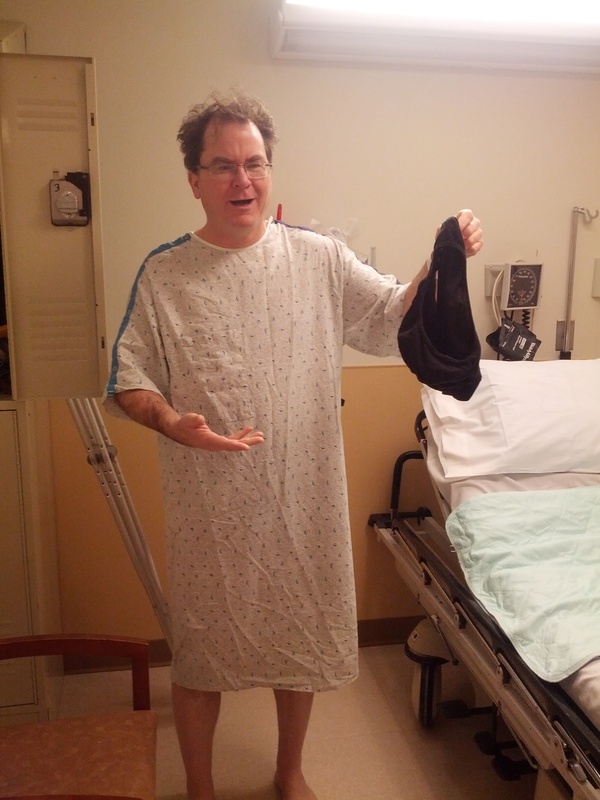 My son Caleb and I are convinced the loss is due to my not wearing the back underwear during my surgical event. 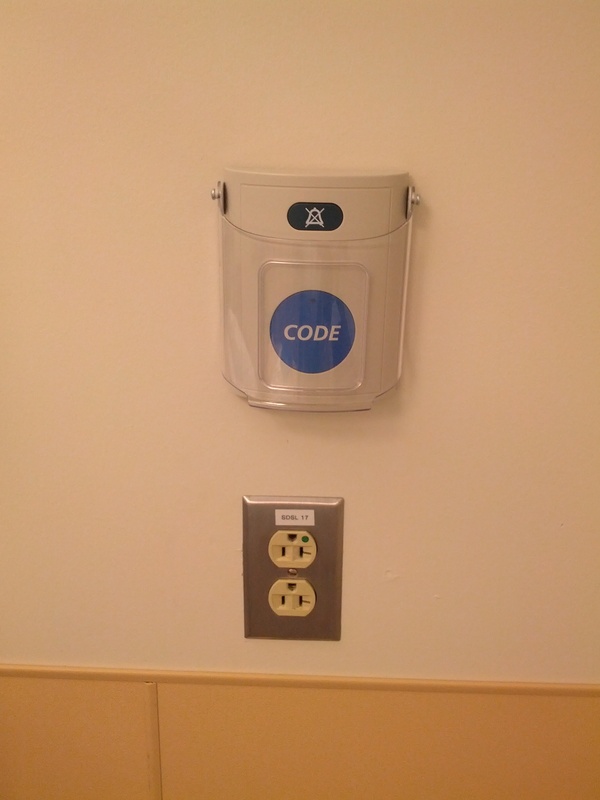 Behind the bed “Code Blue.” You always hear it in the movies … I wanted to start shouting “Code Blue” out, along with “Stat” but I didn’t. 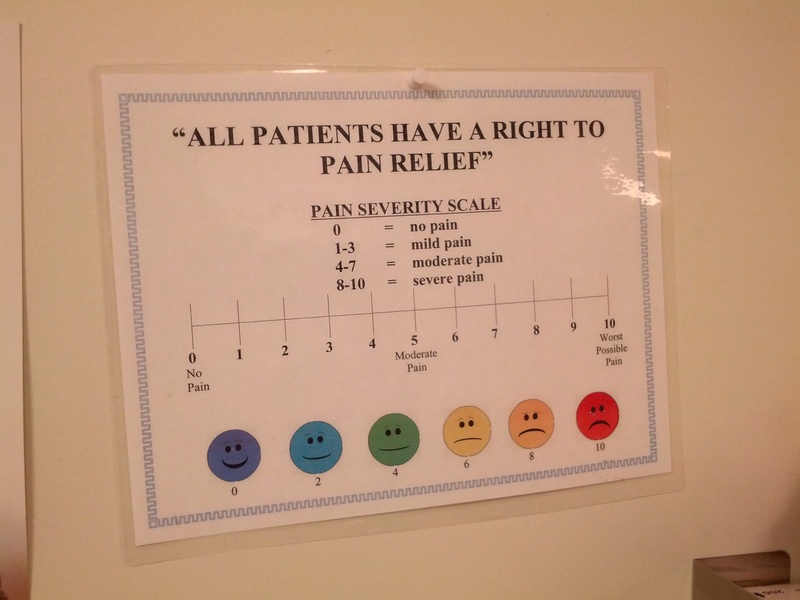 My favorite sign in the hospital … where is the “Comfortably Numb” designation? 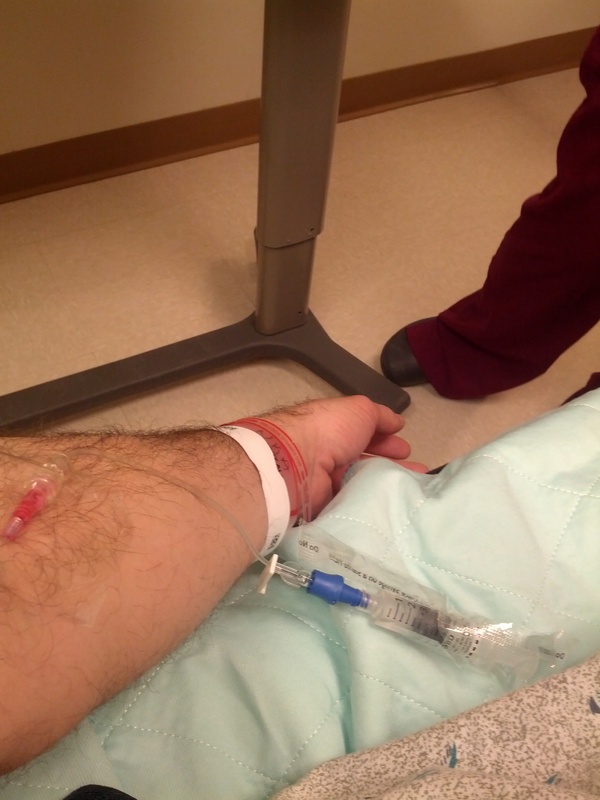 It took a while to get the iv inserted. 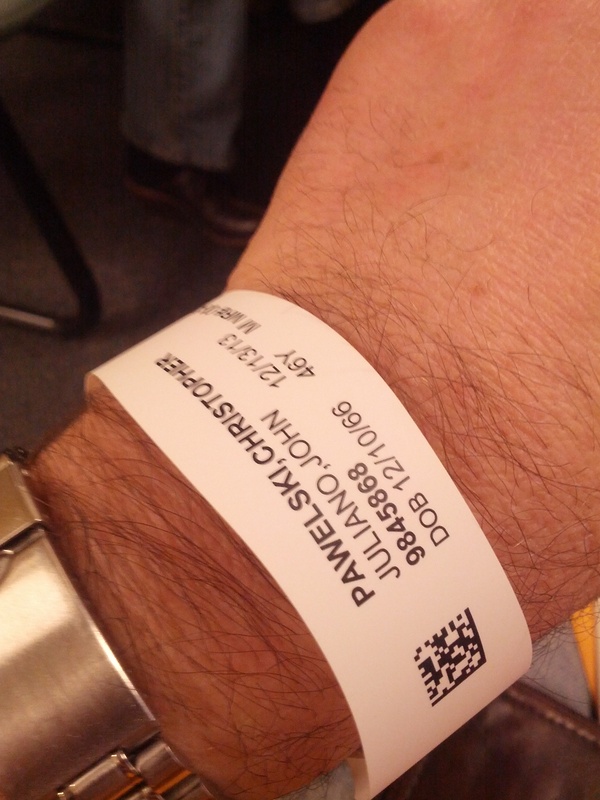 As I explained to the nurse, it always does. I have small veins. 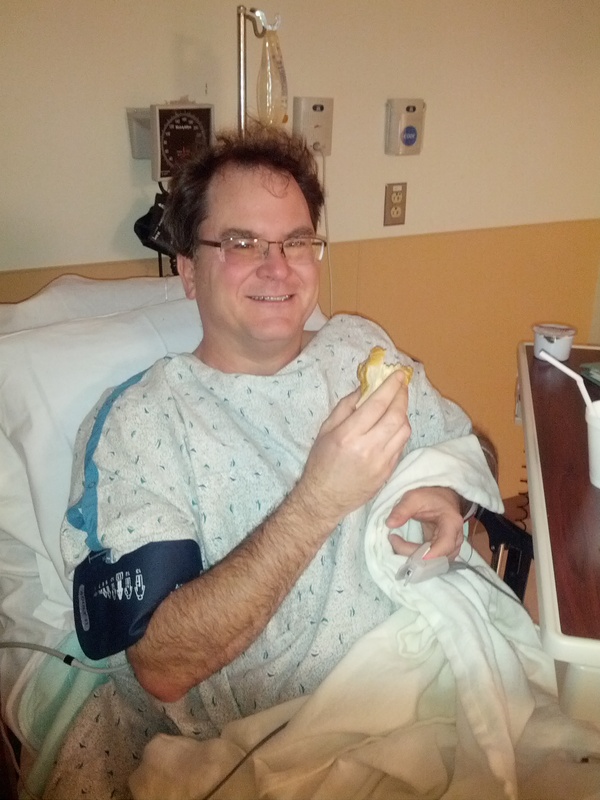 When I had the intestinal blockage back in 2008 for my intestinal blockage they actually had to put it in my hand. The nurses couldn’t get it into my arm. I told her she did a fantastic job getting it in my arm. She laughed. 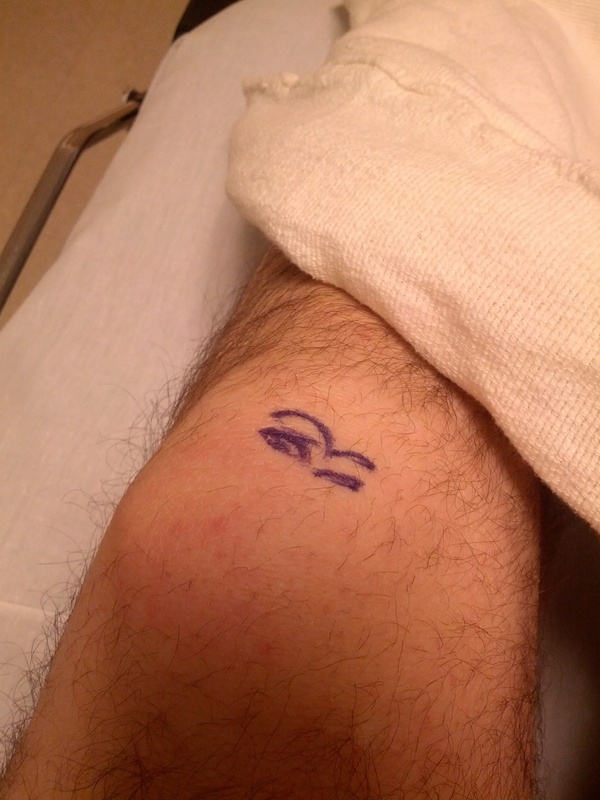 Dr. Juliano came in and said “so, we are doing the right knee?” I paused for a sec with my jaw dropped and he laughed and said “gotcha.” He then marked the left knee. I like that! 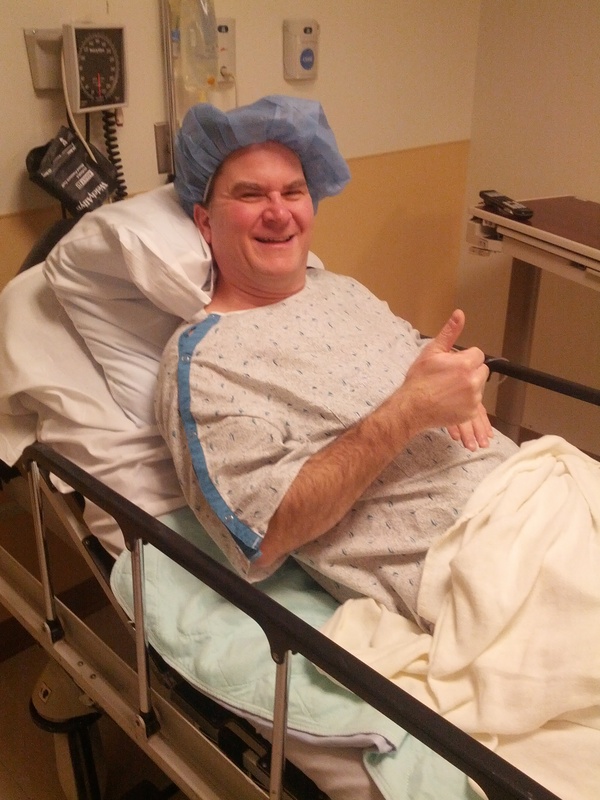 As they were about to roll me in they finally put the hat on me. I told Eve she had to take a pic and she obliged! 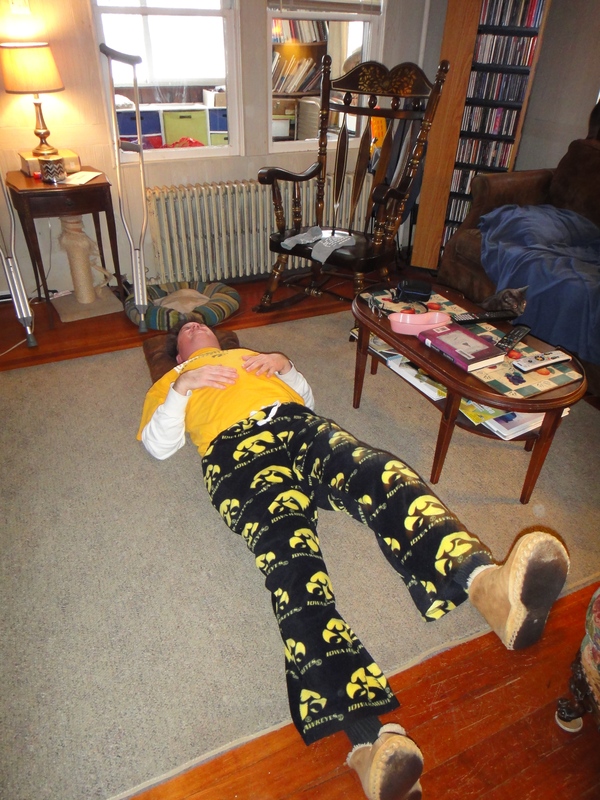 I was then rolled out to the operating room. 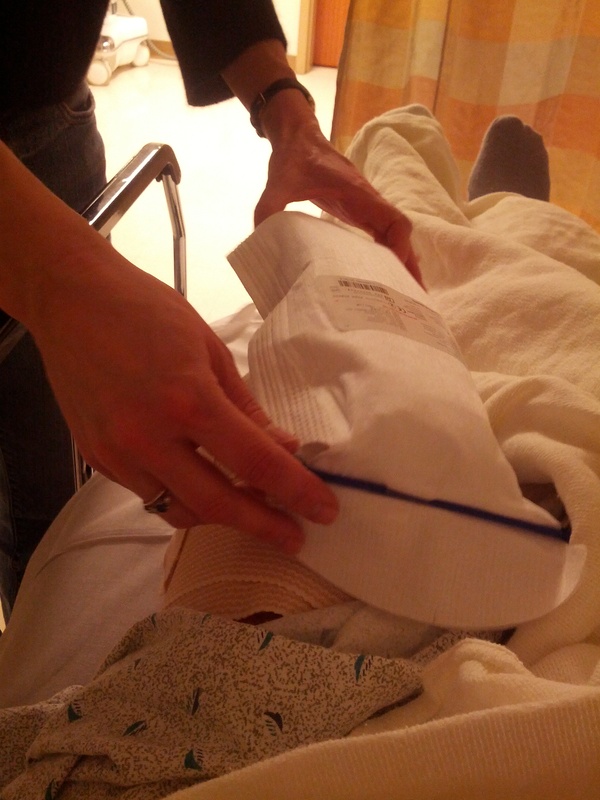 The anesthesiologist administered the anesthesia via my iv as we rolled down the hallway. I thought to myself that I would stay awake as long as possible and make a mental note of when I started to feel drowsy. I was rolled into the operating room and I do not remember anything after I entered the room. 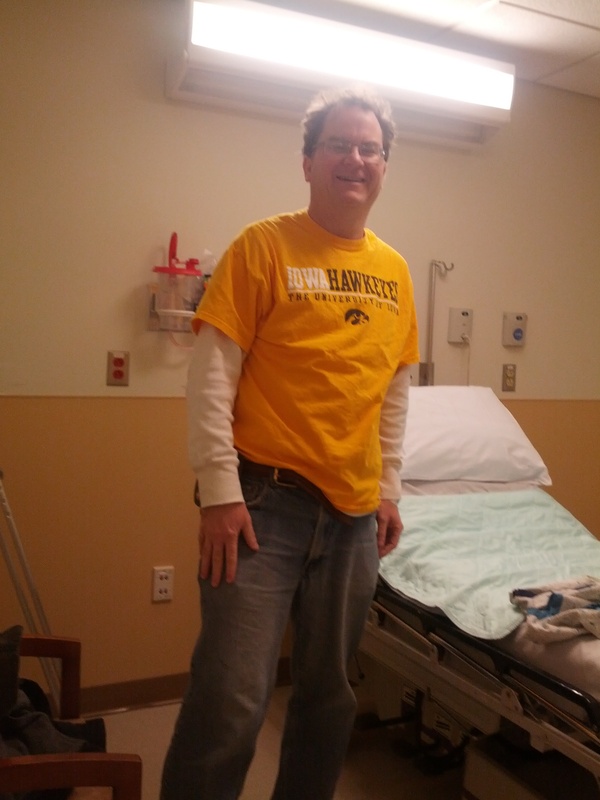 I awoke post surgery in the operating room and the nurses were still cleaning up. I was then rolled back into the prep room and Eve was waiting for me there. They brought me cranberry juice and a roll to eat. I felt fine. No negative effects from the anesthesia and I wasn’t expecting any because I had been put under twice before and both times I experienced no nausea afterwards. At this point Dr. Juliano came in. 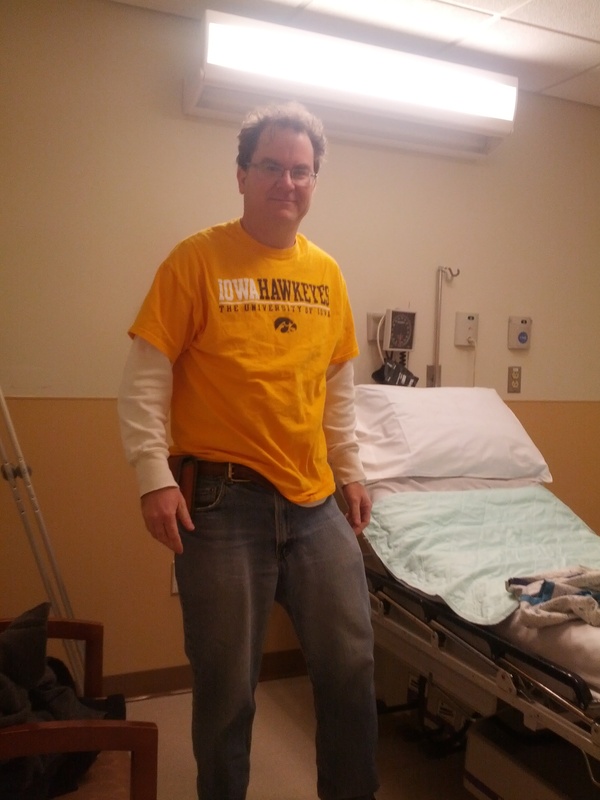 The good news, there was no sign of arthritis in the knee. The bad news, the tear was much worse than he thought it would be and the operation took about an hour longer than expected (surgery was over 2 hours). He said based on what this tear looked like it was not likely a repetitive injury from working the inching pedal/brake on our smaller barn forklift. Something more traumatic caused it. 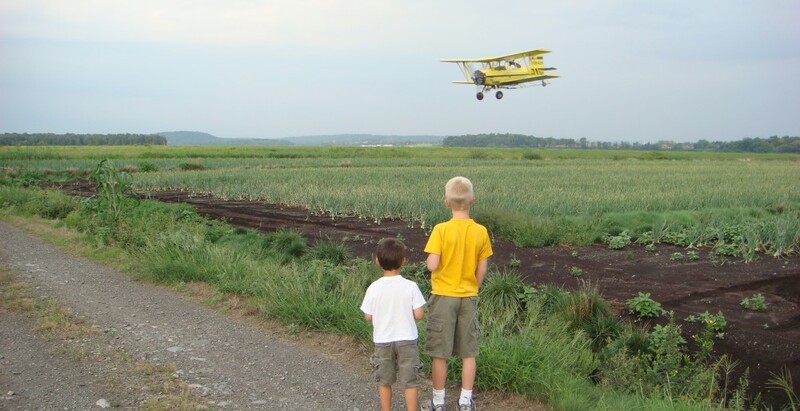 I do so much stupid stuff on the farm I couldn’t even begin to isolate which stupid action on my part led to this. He didn’t rule out a repetitive action totally, but said it was highly unlikely. I have two rare genetic blood clotting disorders. A couple of years ago I tested positive for one positive copy of Factor V (Leiden) mutation and I tested positive for one copy of the prothrombin gene. So Dr. Juliano said instead of taking 1 daily aspirin (which is what I normally do) I should take 2 daily aspirin for the next 5 days, to avoid a blod clot. The nurse then brought an ice pack. I was given instructions on a series of post operative exercises to do and told to ice the area the next few days. I was still a bit dopey and only remember half of this stuff. 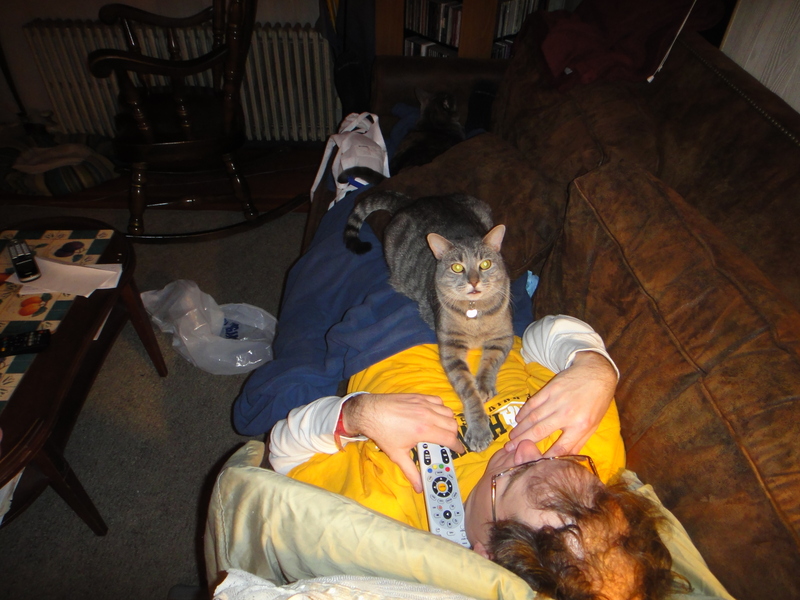 My lovely and extremely patient nurse. 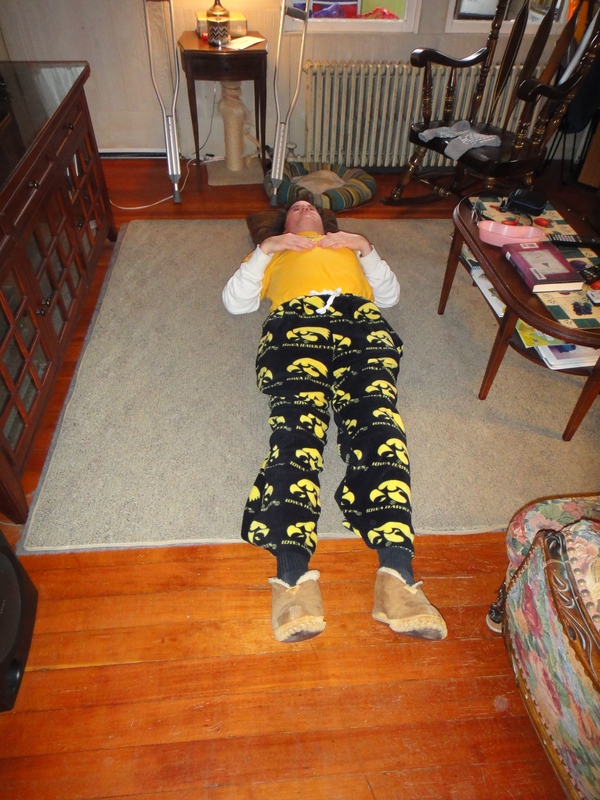 When I sat up after getting dressed I was hit with a wave of nausea … I did not expect this. I told the nurse and she said it’s too bad I didn’t feel it before they removed the iv because they could have given me some anti-neausea stuff in my drip. I had brought my promethazine with me, fortunately, so I took one. It is one of three pills I take in a cocktail for acute headache relief. It prevents and controls motion sickness, nausea, vomiting, and dizziness. This time it didn’t work. I felt nauseous all during the drive to the Florida Pharmacy to get my pain meds and all the way home. When I would then lie on the couch I felt a bit better, though as I started to doze off I started to experience some serious gerd. 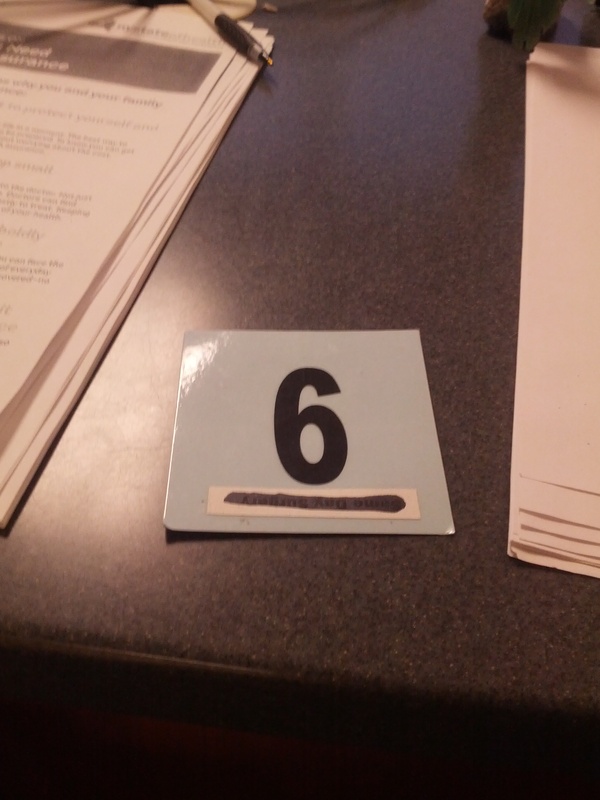 Three or four times material started coming up on me. I also had a terrible headache. So, I took my cocktail of promethazine, tramadol and cyclobenzaprine. Because I took those I only took one percocet for my knee. Despite all of those drugs, and all have warnings for drowsiness, I only fell asleep for a half hour or so. Have I ever mentioned I have a very high tolerance for pharmaceuticals? 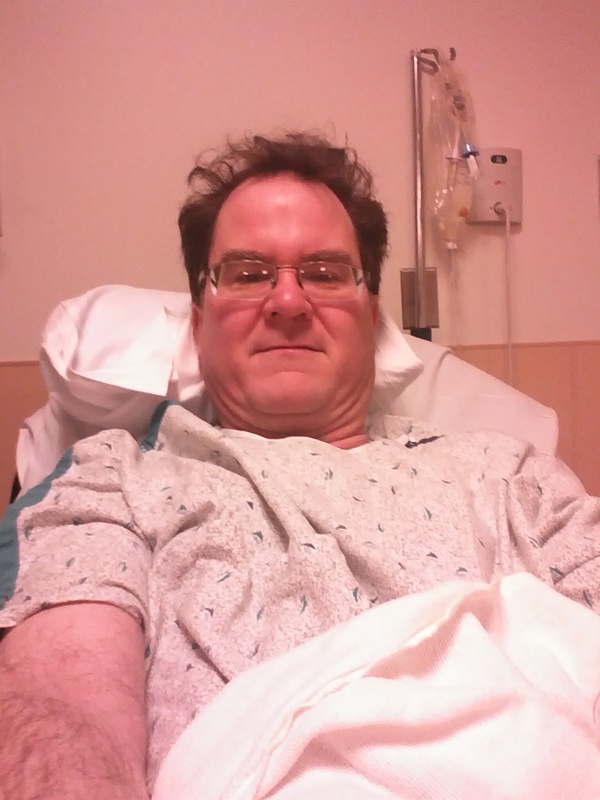 This jerk, and I don’t use that term lightly, did a cystoscopy on me. What is that you ask? I asked to be given a local anesthetic for the procedure. he flat out refused, though I repeatedly asked him for it. He said to em “the procedure doesn’t last that long, doesn’t hurt and you don’t need it.” Eve wanted to walk out and leave but I just wanted to get through with it. After waiting a half hour he did this minimally though still invasive procedure with no anesthetic. He also did no iodine swipe before it. Why did he refuse to give me a local anesthetic? Your guess is as good as ours. The procedure was terribly uncomfortable, no, it hurt when he did it and I had pretty strong pain while urinating for about a week afterwards. He gave me no pain killers post procedure. Well, back to the now! 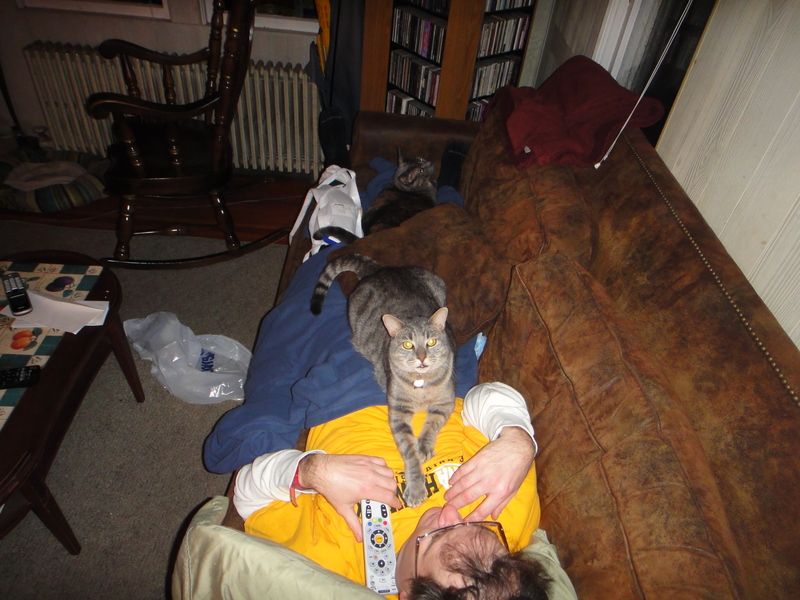 As you can see in these photos I had two friends to comfort me, Chloe on my legs and Bauer on my chest. 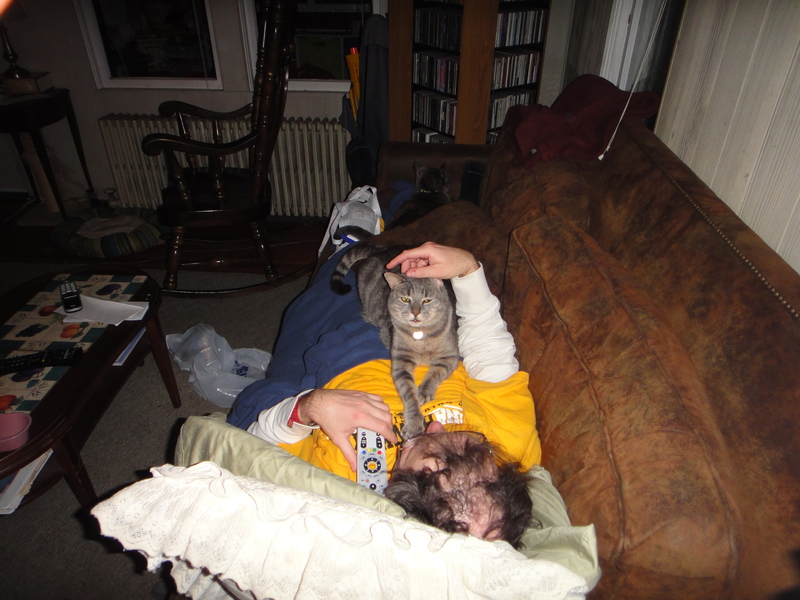 Chloe, who is a fat cat, actually at one point jumped onto my knee. These photos are taken the next day. 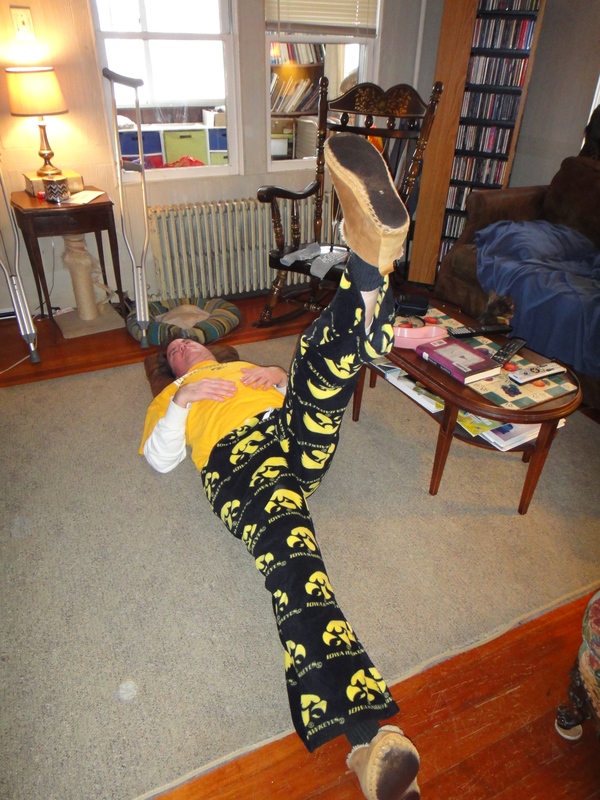 I am doing my leg exercises. Thank the Lord for percocet! 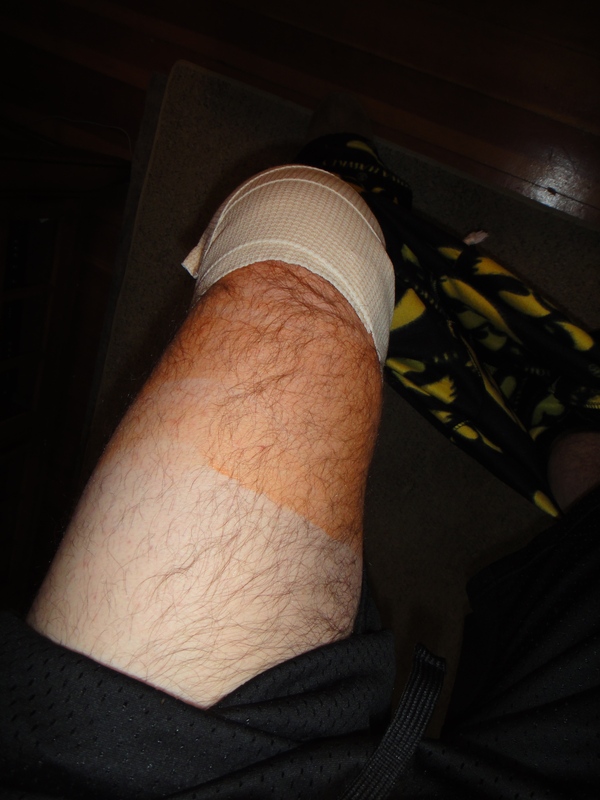 Another image of my knee, wrapped tight. I always have to score some sort of trophy post big event … whether it be a placard or name card or in this case … those special hospital socks with the grippy stuff at the bottom! 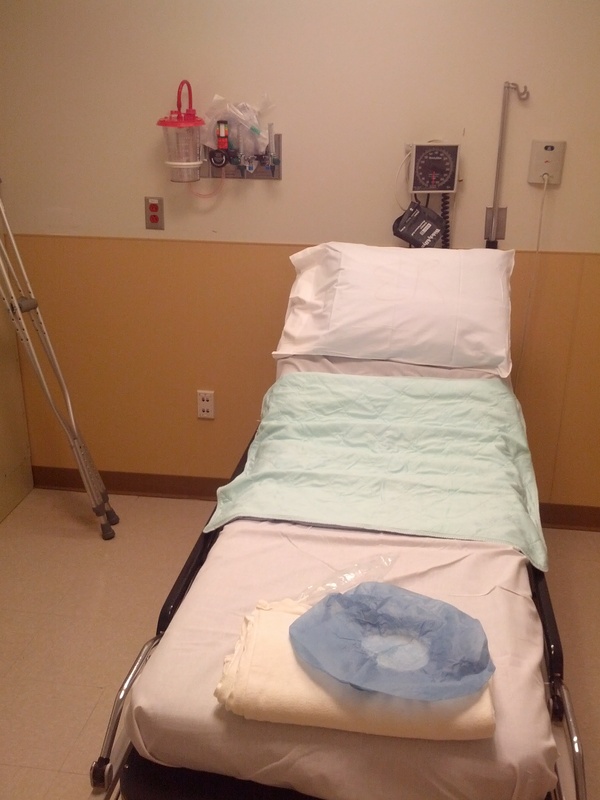 Look for this blog for future updates on my knee and eventually for photos taken during the procedure by my doctor! In the meantime … I have to do this … please check out my Crowd Funder TV Show campaign which currently has 4 backers! The segment will be coming shortly I will promptly post it once it is available! This campaign is not “all-or-nothing” and supporters get dollar for dollar matching gift cards from places like Best Buy, Home Depot, Starbucks and Sears. Talk about win-win … if you plan on doing any shopping at any of those locations it’s like supporting me for free! If you backed me on Kickstarter I hope you consider backing me on The Crowd Funder TV Show campaign! And I hope you can spread the word! Oh, it is now been 6 days since I contacted Outback Corporation about getting a free Bloomin’ Onion after it was announced Iowa would play in the 2014 Outback Bowl. How can they refuse gong a 4th generation onion farmer who is an Iowa graduate a free Bloomin’ Onion? Come on Outback … do the right thing! This entry was posted in Uncategorized and tagged #GivingTuesday, 2005 Capital One Bowl, 4th generation onion farmer, Agricultural policy, arthroscopic surgery, Best Buy, black dirt, Bloomin' Onion, bulk boxes, charity, Chris Pawelski, complimentary Bloomin' Onion, contribute, corporations, crop insurance, crowd funding, customer service, Dr. David Cohen, Dr. John Juliano, farm, farmer, farming, Farmroot, fruits and vegetables, giving back, Giving Tuesday, Goshen New York, Home Depot, Iowa Hawkeyes, Iowa University, Iron Bowl, LSU, memoir, meniscus tear, muck, Muckville, Muckville: Farm Policy Media and the Strange Oddities of Semi-Rural Life, Nick Saban, onions, Orange County New York, Outback Bowl, Outback Restaurant, public policy, Sears, specialty crops, Starbucks, steroid shot, thank you, The Crowd Funder TV Show, therapeutic massage, University of Iowa graduate, vegetables, vegetables and fruits, Washington DC by chrispawelski. Bookmark the permalink. Why thank you. About a half year. What, pray tell, does “ekgefbkbed” mean? Interesting and nice article. I hope you are doing well now. For those who dont know about knee arthroscopy , Its a surgical technique that can diagnose and treat problems in the knee joint. During the procedure, your surgeon will make a very small incision and insert a tiny camera — called an arthroscope — into your knee. This allows them to view the inside of the joint on a screen. The surgeon can then investigate a problem with the knee and, if necessary, correct the issue using small instruments within the arthroscope. I am! Thank you! And thank you for your interesting comment!